Mitt Romney has said that if Donald Trump were elected president it would normalize misogyny, bigotry and racism in the national conscience. Meg Whitman the CEO at Hewlett Packard compared the Republican presumptive presidential nominee to the late Adolf Hitler. Paul Ryan the Speaker of the House was asked how he would explain his endorsing Trump to a child. Then the supporters of Trump spoke up, referring to 300 executives in business, establishment donors with the GOP and strategists gathered for the annual ideas festival of hosted by Romney to unite the party for the campaign this fall. With noticeable defiance, Reince Priebus the Chairman of the Republican National Committee said Trump and the GOP were going to win the election with or without you, according to those attending the event. The event took place for three days and concluded on Saturday, highlighting the stark contrasts in the philosophical and moral divisions over the new standard bearer on the block. It also underscored the difficulty Trump and his allies like Priebus will have to begin the campaign for the White House in which Hillary Clinton starts out as the favorite. 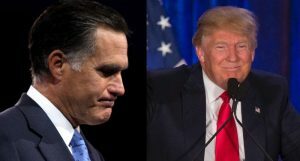 Romney was clear he did not support Trump while delivering his case on Saturday against real estate mogul. Romney said the campaign rhetoric of the real estate mogul is so destructive it is beginning to fray at the moral fabric of the nation and could eventually cause trickle down racism. Romney added that he loved what the U.S. was built upon, its values and seeing what is happening breaks his heart. Trump during a Tampa rally pushed back at the 2012 Republican Presidential nominee calling him sad, poor Mitt Romney labeling him a stone-cold loser. Many associates of Romney however have asked him to tone his opposition down for the party’s interest and its unity. While Romney cultivated relationships for more than a decade with GOP benefactors, Trump is just now attempting to attract major support financially, after self-financing most of his campaign during the primary season. Just this last week, Trump began joint fundraising with the RNC including a number of events for June that needed financing. In comparison, Romney had raised already over $140 million by the end of June 2012. Veterans in fundraising have acknowledged that the RNC and Trump team have a short amount of time to put together the lavish events usually held to solicit checks with six figures.